We analyzed 39 exchanges and collected 1500 coin pairs having spread on different exchanges for you to make a profit. Subscribe for $9.90 per month only! Arbitrage is a real way to generate revenue with low risk. You use price difference of same crypto coin on different exchanges. Buy coin with lower price on one exchange and sell it with higher price on another exchange. Our service is neither crypto arbitrage bot nor arbitrage software, but a service providing you information about price difference for many coins on different exchanges in real-time. Our service will help you to use your arbitrage strategies more effective and successfull. 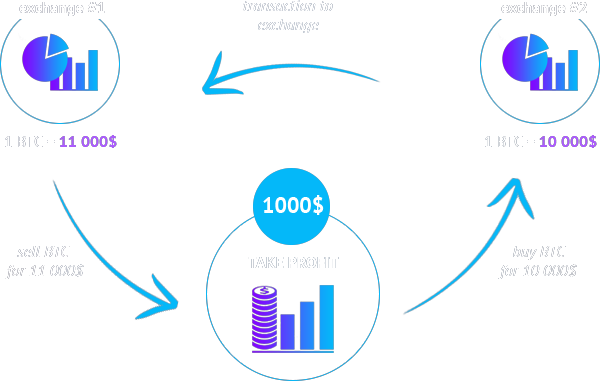 Additionally to thousands coins spreads between exchanges our service automatically finds “reverse way” spreads for returning your assets back to original exchange with another coins. 1. Register in the system and get your trial access to information about spreads. 2. Choose coins pair for arbitrage having appropriate spread on some exchanges. 3. Execute selected arbitrage strategy. 4. Take a profit just for $9.90 per month.